Breast cancer is the leading cause of cancer death among women worldwide, and there is only a limited explanation of why. Risk is highest in the most industrialized countries but also is rising rapidly in the developing world. Known risk factors account for only a portion of the incidence in the high-risk populations, and there has been considerable speculation and many false leads on other possibly major determinants of risk, such as dietary fat. A hallmark of industrialization is the increasing use of electricity to light the night, both within the home and without. It has only recently become clear that this evolutionarily new and, thereby, unnatural exposure can disrupt human circadian rhythmicity, of which three salient features are melatonin production, sleep, and the circadian clock. A convergence of research in cells, rodents, and humans suggests that the health consequences of circadian disruption may be substantial. An innovative experimental model has shown that light at night markedly increases the growth of human breast cancer xenografts in rats. In humans, the theory that light exposure at night increases breast cancer risk leads to specific predictions that are being tested epidemiologically: evidence has accumulated on risk in shift workers, risk in blind women, and the impact of sleep duration on risk. 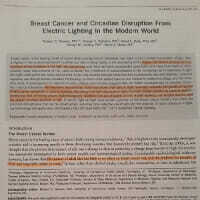 If electric light at night does explain a portion of the breast cancer burden, then there are practical interventions that can be implemented, including more selective use of light and the adoption of recent advances in lighting technology and application.